Organizing wedding shuttle service sounds like a big hassle, but Bus.com is here to streamline the process. We’ll match you with the ultimate bus for your wedding, one that suits your budget and your personal style. No matter the size of your guest list, there is a bus (or fleet of buses!) that can handle your transportation needs. Chartering a bus for a wedding is cost-effective, reliable, safe, comfortable, and, best of all, it keeps the party going even when you’re on the road. 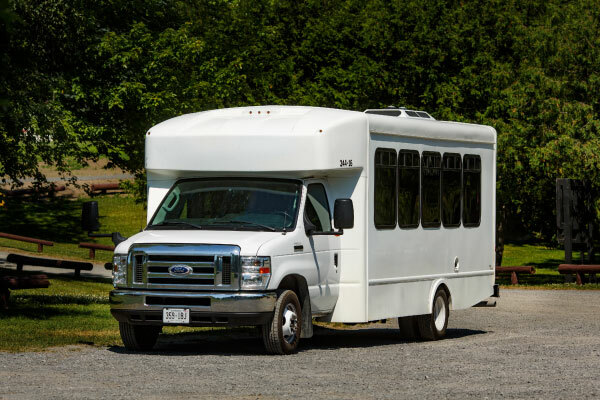 How much does it cost to rent a wedding shuttle bus? The cost of your wedding shuttle service largely depends on the amount of time you will require the bus driver. Use our online booking tool to get a better idea of what that means for your wedding. Our quotes include your driver’s time, industry-standard tip, and accommodations, as well as any applicable taxes. How do I rent a wedding shuttle bus with a driver? When you charter a bus through Bus.com, a driver is automatically hired. We’ve implemented an extensive vetting system that determines whether or not we work with a driver, so you can be sure the right person is behind the wheel. To organize a wedding shuttle service, call our booking specialists at 1-855-428-7266. What kind of buses are available for wedding shuttle services? School buses,coach buses,mini coach buses, and minibuses are all available for wedding shuttle service. The big trend is to rent a school bus for your wedding, but there are many options. To choose your ideal bus, you’ll first need to calculate the time you’ll spend on the road and the number of guests you’ll transport. Once you have that, decide which amenities you need – A/C, audio-visual equipment, power outlets – then request a quote. 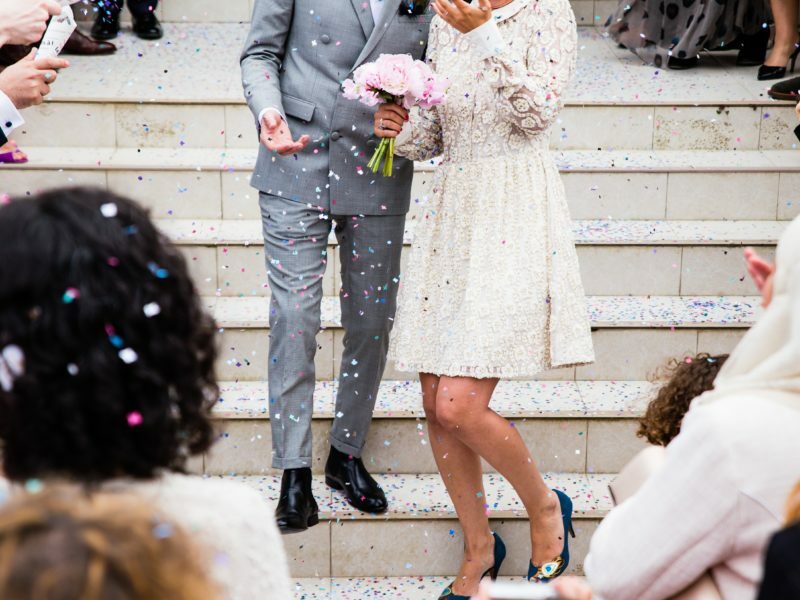 When should I book my wedding shuttle bus rental? 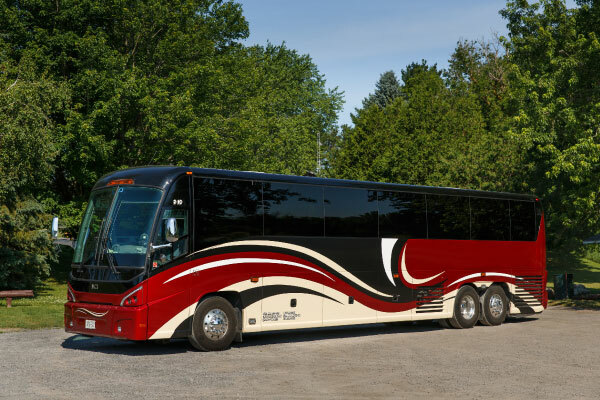 We usually recommend booking your charter bus six months in advance. But, if your wedding falls between April and June, we recommend booking even earlier to avoid competing with graduation season. During the wedding transportation planning process, take a look at your city’s most popular wedding dates. If your special day falls on any of those dates, we recommend booking your wedding shuttle nine months in advance. The folks at Bus.com know buses and they know event planning, too. Booking specialists will make your wedding transportation go off without a hitch, so you can focus on getting hitched. Pun intended! Instead of spending hours upon hours calling bus rental companies to find the best quote, have Bus.com do that for you. 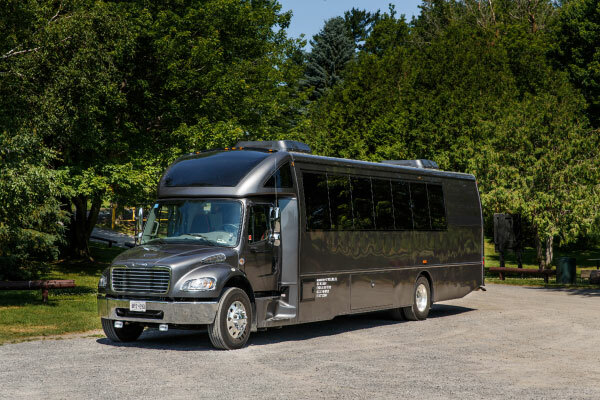 Our online booking tool instantly searches our North America-wide network of bus companies to find the best wedding bus rental at the best price. Our staff is friendly, approachable, enthusiastic, and, most importantly, knowledgeable. They’re on hand to answer questions at any point in the process. Whether you’re looking for a place to park your bus or you need to know how to contact your driver on the road, our booking specialists can help. 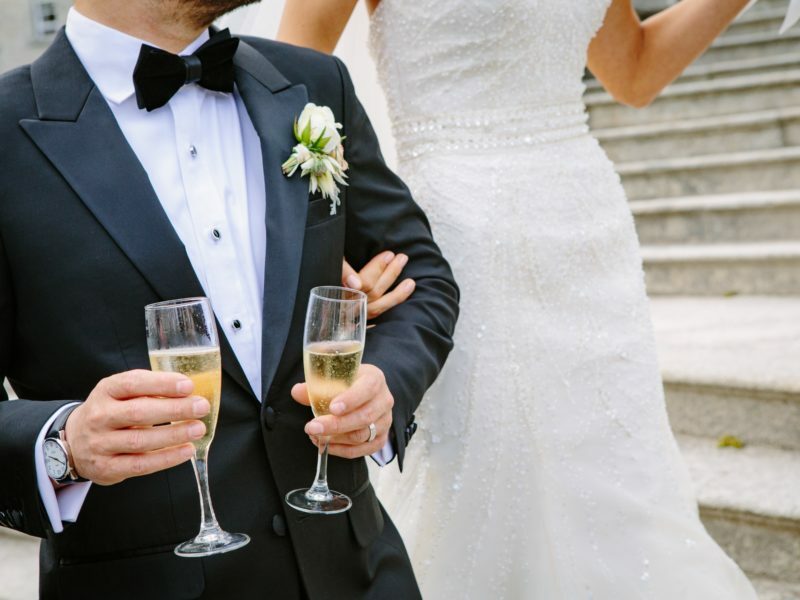 Wedding parties are about a lot more than just the star couple. Bridesmaids and groomsmen alone can add up to 12 people, or more! There’s also the parents, the flower kids, the ring bearers, and the officiant. That can add up to be 30 people—three times the capacity of the average stretch limo. Rent a minibus or mini coach bus to transport your wedding party for a comparable price to a limo. Think of the grand entrance you’ll make when the whole party arrives at the reception together! If there’s one universal truth in the world, it’s that no one likes parking. Avoid it completely with a wedding bus rental for all your guests. Your driver can drop your guests off at the location and pick them up later. No one has to worry about organizing valets or reserving street parking. Problem solved! Sipping one too many cocktails at a wedding can happen to anyone. It’s a party! But just because it’s the norm doesn’t mean you shouldn’t do it safely. Providing a wedding shuttle bus for your guests will ensure everyone arrives back at their hotels without getting behind the wheel. This is extra important if your venue is in a remote location where there is limited access to taxis and public transportation. The engagement party is the parents’ opportunity to celebrate the soon-to-be-married couple and to show off a little. Book a wedding shuttle bus to transport guests from a hotel or central pickup location to the venue. This will be especially helpful to distant relatives flying in for the event. 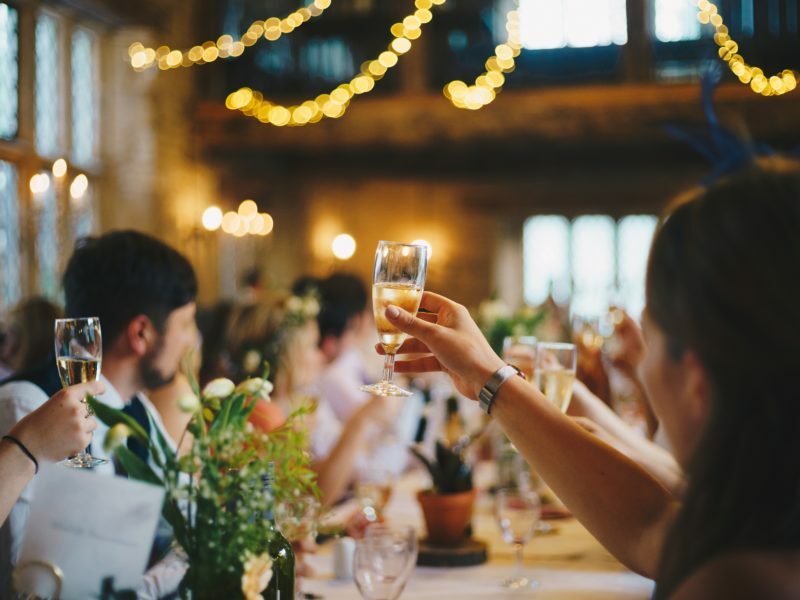 With growing guest lists and longer events (some of these adventures can last all day), you’re going to have to book transportation for your bachelor or bachelorette party. Rent a minibus for your group of bridesmaids or groomsmen and keep them safe and together as they wreak havoc on the town. The bridal shower is usually a surprise for the bride, and what better surprise is there than showing up at her doorstep with a mini coach bus? Whisk her away to the spa, to brunch, or on a shopping spree. 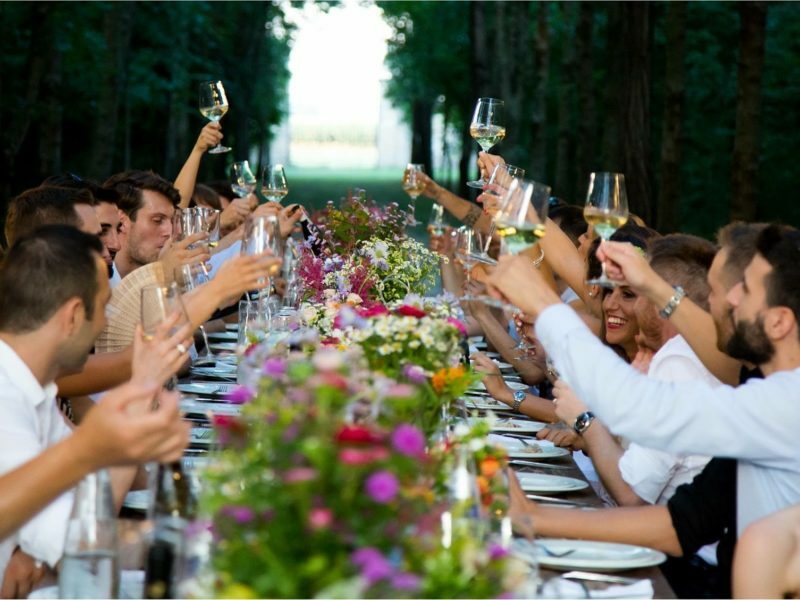 Bus.com will help you organize the perfect bus itinerary for your bridal shower. Which bus is the right fit for your wedding? Say 'I do' to your perfect match. Find out more about what chartering a bus means, how much it costs, and what you need to do before you accept a quote with our Ultimate Guide to Bus Rentals. Choose your bus! Our Quick Guide to Choosing a Bus Type will help you select the bus that will best accommodate all your wedding transportation needs. Generate a quote with our online booking tool.